The Watermark International Buffet was opened in Glenelg in 2000 and is in walking distance from the Glenelg beach front and popular shopping precinct Jetty Road. This restaurant is a popular venue for families as there is a large choice of foods to choose from, making it suitable for people of all ages. The restaurant is particularly child friendly with children under fourteen receiving free soft drink refills and having the option to play in the games room separate from the restaurant. The size of the restaurant seating area is huge and tables are frequently made up to cater for large amounts of people. It is common for birthday parties to be held in the venue. The buffet includes a large range of foods from soups, roasted beef, pork and lamb, fried foods, pasta and pizza cooked in a wood fire oven, a vegetarian selection, salad bar and international and Asian cuisine. There is also a separate pastry bar which has over seventeen choices of desserts to pick from. The buffet is interesting as patrons can watch the food being cooked behind the buffet as the chefs are visible along with the rotisseries, grills and wood fire oven. The buffet style of eating makes the Watermark attractive to families young and old and is a great choice for a big lunch or dinner. 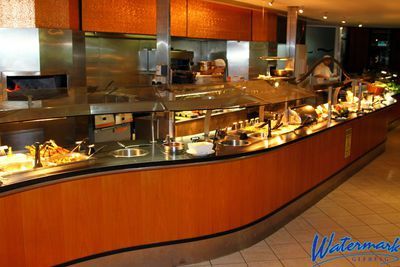 When we go to Adelaide we always go to this buffet, best ever food.Make sure you go there as you won't be disapointed. Sorry, have to disagree, this was one of the worst buffets we've been to. Lots of variety but we could not pick out one thing that was 'quality'. The playroom they supposedly have to keep the kids entertained is not all its cracked up to be either, its a tiny room full of arcade machines which means you have to pay money to use them and definitely not suitable for the toddlers. For a buffet, I would go the international/seafood buffet at SkyCity (Casino), not the best but far better. We visited the Watermark recently. We all enjoyed the food. Something for everyone. The spicy fish was particularly nice.